Urmul Jyoti Sansthan are working in the Thar desert to combat blindness among the rural communities through specialist treatment and eye care to realize the world`s VISION 2020. 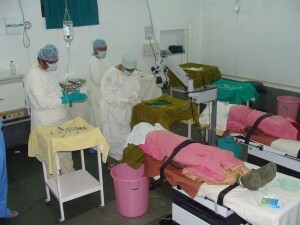 The Jyoti Eye Hospital is known throughout the state of Rajasthan and has today acquired a name and reputation for itself beyond the state’s boundaries as well. This Hospital is one of the three flagship programs of Urmul Jyoti Sansthan set up at its campus at Nokha where people from all over the district, state as well as from other states today converge to avail of eye treatment, surgery and optic advice. The Jyoti Hospital today has 50 beds with a separate female ward, adequate flush toilets and bathrooms in a complete hygienic condition. It has a state-of-the-art infrastructure with ultra modern equipment like Operating microscope, Slit lamp, Karatometer, Ascan, Yaglaser, Auto-reflectometer, Green Laser etc. Needless to say ,the operation theatre is par excellence with air conditioning/heating facilities. Our skilled human resource include 2 eye surgeons and 7 paramedicals,most of them residents and available 24×7.Another informative and demystifying facility which the hospital has incorporated is the live screening of the surgical process. This is done with the help of an LCD monitor which beams the operation live to viewers (attendants of the patients) so that they can understand the process. Every year more then 4000 people get a view of beautiful desert with the help of Urmul Jyoti.